1: Cat & Jack Egg Hunt Hair Clips- Cat & Jack always has the cutest accessories, my girls love these little hair clips, especially when sporting their favorite "piggy bun" hair style! 2: Alex Toys Craft & Color Cuddle Washable Bunny- Avery would go crazy for this bunny! You can color, cuddle and then wash the bunny clean, making it ready for you to decorate all over again, so fun. 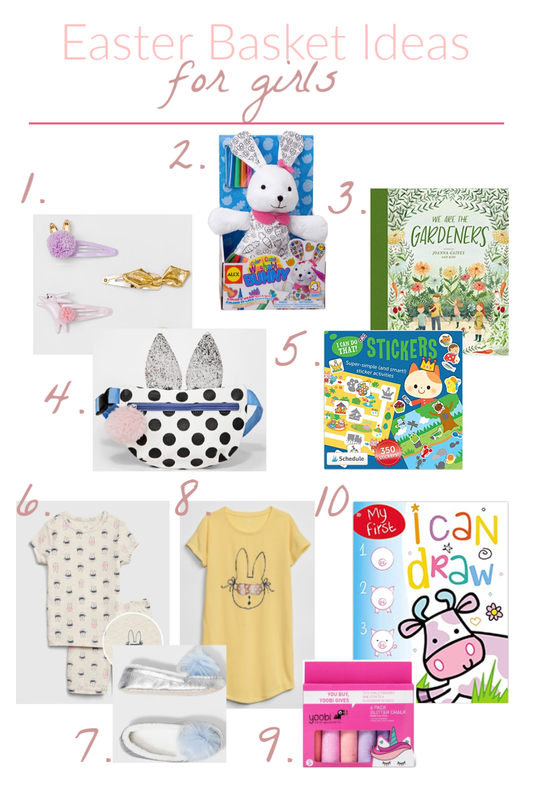 3: We are the Gardeners by Joanna Gaines- I'm going to include this book in Isla's basket, it's a beautiful book and I always include one book in each of my little lady's baskets. 4: Bunny Fanny Pack- I mean, the thought of Avery and Emmy walking around with fanny packs made me throw this in my Target cart faster then you could say "fanny pack." I mean how cute!?! 5: I Can Do That! Sticker Book- This is an AWESOME first time activity/sticker book, I grabbed Emmy her own book, this would be great to bring along to church Easter morning, or if you have to travel for Easter. 6: Toddler Sleepy Bunny Pj's- PJ's are such a cute and useful addition to an Easter basket and this little bunny sleep mask print was too cute to pass up. 7: Metallic Moccasin Slippers- These little slippers are so adorable and actually stay on my girl's feet, the pom pom is such a cute touch and they are super warm and cozy too. 8: Girls Sleepy Bunny Nightgown- Avery is all about nightgowns and I love how this one coordinates with her little sister's bunny pjs. 9: Unicorn Glitter Sidewalk Chalk- We go through sidewalk chalk like crazy in the summer, this set is sparkly and even comes with a unicorn stencil. 10: I Can Draw Book- Avery has this book and LOVES it, another great book for your kiddo to take along to an Easter celebration or long car ride, throw in a set of colored pencils and you are good to go!